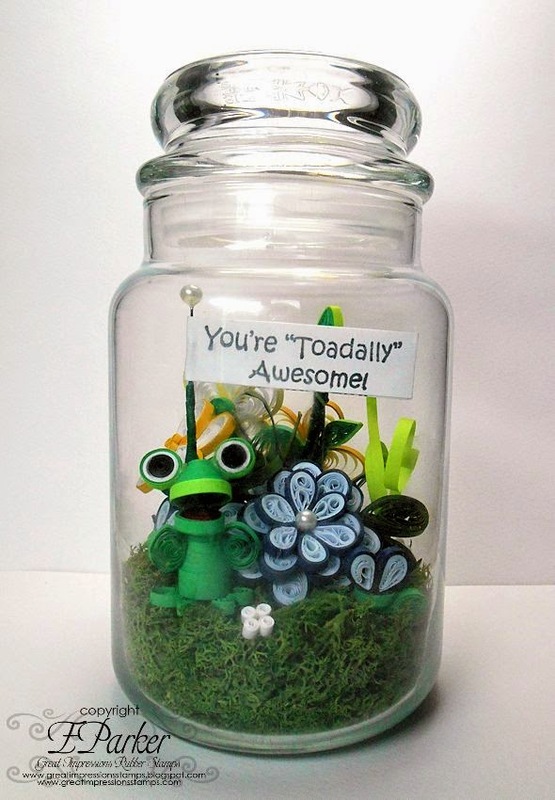 Great Impressions: You are Toadally Awesome! Hello to all of my Great Impressions friends! Welcome back for more inspiration from the Great Impressions store! This is a used Yankee Candle jar that I cleaned out and repurposed for my little garden. I thought I would give you a close up of my toady. This is the first time I have done 3D quilling and I think he is just adorable! This is the back of the garden and you can barely see my little 3D lady bug so here is a close up below. Wow, that was a lot of pictures! Do you want to learn more about how I did this? Please stop by my blog for all of the details! Wow! An awesome jar garden. Beautiful work Ellen. Have a great day. Oh my goodness...how cute is this!